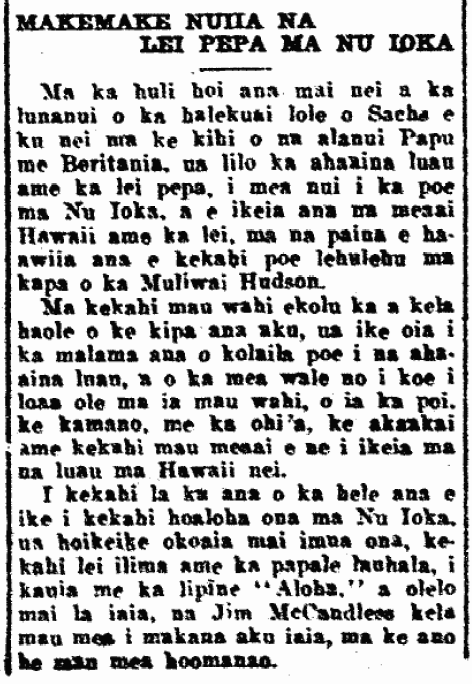 25th Annual Kamehameha Schools Luau, 1912. For the twenty-fifth time, the Kamehameha Schools held a luau on the night of last Saturday, and a great number of Kamehameha Schools graduates: boys with their wives, and so too girls with their husbands; and it was a time for the old people to get acquainted with the new, and a time to rejoice, and to listen to the speeches prepared, and the main thing was the feasting on tables weighted down with foods prepared by the students of the school. In attendance were the teachers of the schools, some of the trustees, and a few invited malihini; they ate heartily, and there was leftover for those who prepared it [? ], and everyone went home at the proper time with pleasant thoughts on what was seen that night. After stomachs [ka lua o ka inaina] were filled, everyone enjoyed some songs from the boys of Kamehameha, and also from the girls, and the Honolulu band, then the speeches of the night were heard. From the school, President Horne gave the first speech, that is, he gave his thanks for the gathering of the students on that night, which was something that the school was happy about, that the students of Kamehameha always come back to see the school which educated them. According to him, in learning from the students how they are living, that being not going into debt; each of them are have still gone in debt; they are indebted to the Kamehameha School, and the benevolence of Bernice Bishop, the one who founded this school. Following him, Faxon Bishop was called, and he explained the falsity of what he heard about the lack of advancement of those who graduated from the school. There have been many things which he has heard about the children of Kamehameha after they leave the school, and to put an end to his misconceptions, he instructed the principal, Mr. Horne, to supply him with the roster of all students who graduated from the school, along with their occupations; and when he saw the list, he exclaimed about the falsehood of all that he had heard. From amongst the 261 students who graduated from the school, he separated them into their current occupations, along with those deceased and those whose occupations are not known. These are the students of Kamehameha by their different occupations which benefits their lives as well as that of their families. From within the great number of children who graduated, 63 of them are working in skilled labor; 50 are in secretarial, bookkeeping, or office work; 20 have deceased; 18 are in the teaching profession; 17 farmers; 10 in singing; 9 in the postal service; 7 with the street cars; 7 in the police force; 6 of them are ranked deputy sheriff; 6 are architects [kahakii]; 6 at the custom house [kukeawa]; 4 in roadwork; 3 in the army or navy; 3 drivers; 2 in law school; 2 newspaper editors; 2 stevedores; 2 in the board of health; 2 are day laborers [limahana hana la]; 2 are ticket agents; 1 is the head of the jail; 1 undertaker; 1 bank employee; 1 pastor; 1 lighthouse keeper; 1 head of a store; 1 at Kalihi Camp; and as for those whose occupations are unknown, there are 4. By this list of occupations of the children, he said that there is absolutely no school known which have graduates that have progressed in this manner, which contradicts the truth of what he heard. At the close of his speech, one of the old graduates of the school was called up, Deputy Sheriff Oscar Cox of Waialua, and it was he that instructed the trustees that they also should look after the welfare of all of the students of Kamehameha who graduate. There are two major points he spoke of on that night pertaining to the progress of the school, that being the trustees acceptance of the importance of paying heed to the longevity of the tenure of the teachers within the school, and to not have them just stay for a short period and return to America, followed by the arrival of new teachers; that just leads to the the children not having a unified education. The other point was the importance of paying attention to the children when they leave the school. He encouraged the youths living in this town now to return to and to live in the country, for according to him, there are many jobs in the sugar plantations, and should there be boys going back to Waialua, he believes he will be able to assist them in finding proper work by talking with the people in the sugar plantations. He pointed out to the board of trustees that there is much land all over, and should the trustees care for the well being of the youths of Kamehameha, then it is of great importance that they give out those many acres of land to those youths going into farming, raising livestock, or other endeavors that will benefit them, along with granting them a sum of money for their use; and in that way, according to him, if there was this assistance, he would leave his government position and start working where he would gain an independent livelihood, and he would be able to care for and educate his children. There was much appreciation for the Mr. Cox’s speech amongst his fellow schoolmates, as they continued to clap, however the thoughts of the trustees have yet to be seen. From what was said about the luau that was held, it was a party leaving everyone gratified. 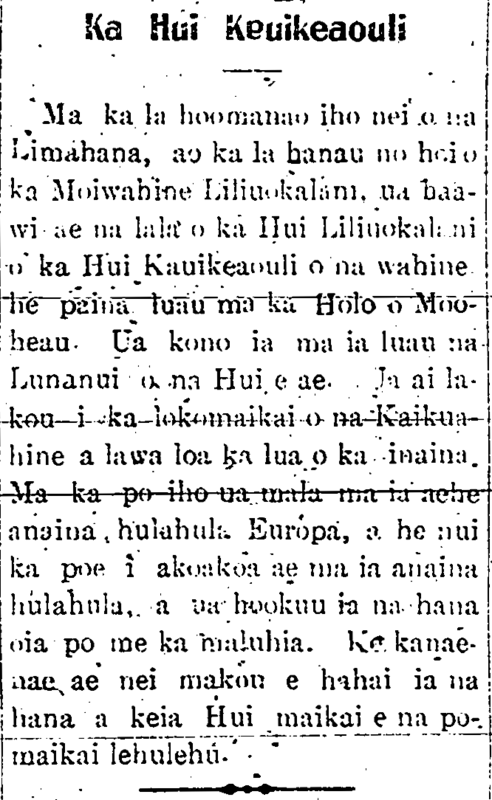 Ka Nupepa Kuokoa, Buke XLVIII, Helu 24, Aoao 4. Iune 14, 1912.